Elizabeth Hand: Generation Loss | shigekuni. Over the past year I have read quite a few crime novels in between doing work and other things, and I’ve increasingly felt that there are two specific things a good crime novel will do well: it will have mastered the generic structure of uncovering a crime (subverting the structure is its own kind of mastery), and it will be about something unrelated to the murder business. I find I am easily tired of the Elizabeth George type of contemporary crime novel – where characters and setting basically fill in the gaps in the mystery structure. I understand the appeal – and a well executed generic mechanism can be a thing of beauty, and is often underrated by “literary” critics. Novels that do both aspects well, however, are rare. One such writer I enjoyed greatly is CJ Sampson whose novels set in Henry VIII’s time work enormously well as crime novels, but who also use the historical context as more than attractive setting. Similarly, some of the most lauded crime novels of the past years take on the topic of racism in the American South, like Lori Roy’s Bent. Moreover, it appears to me, writing a novel that connects both spheres – or just writing an exceptionally tightly structured crime novel – can be like catching lightning in a bottle – often, previous and subsequent attempts fall far short of the mark. All this is to say that Elizabeth Hand’s novel Generation Loss is an almost perfect example of what I enjoy in a crime novel, and the one sequel I have read of it, Available Dark reads like an underdeveloped print of what made the original book succeed – and indeed I am apprehensive of reading the third and most recent installment. 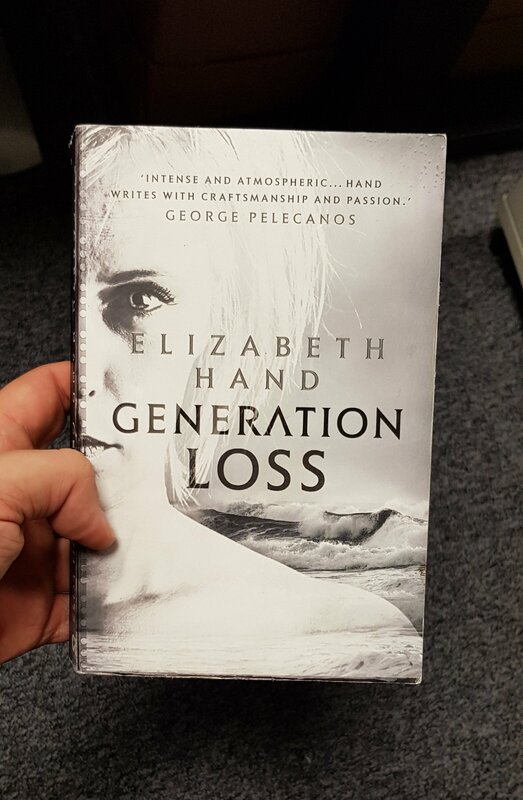 Generation Loss is not Elizabeth Hand’s debut – far from it. Hand has been writing speculative fiction since the early 1980s, but for her 2007 novel Generation Loss she switched into realism, producing a noir crime novel that seems quite unique in setting and outlook, but underneath the hood of this remarkable book is a finely tuned generic crime mechanism. The introduction of characters, of the central mystery/crime, the small revelations that drive the plot and finally the big confrontation and resolution are both generic and extraordinarily well paced. But just as a lot of midsize cars built by the same company have the same motor but appear to be different brands, what makes Generation Loss so unique is Hand’s choice of setting and characters. Much of the plot may be mechanical, but Hand’s mastery is so deft that the plot’s movements seem to derive from an internal logic of settings and characters rather than from the execution of a genre-based mechanism. The protagonist of Generation Loss is Cass Neary, who works in a bookstore and is generally quite miserable. She is a photographer – or rather, she used to be a photographer, who produced one well regarded book and then fell into obscurity. When the novel opens, she barely makes a living as a clerk in a bookshop. Like Elizabeth Hand, Cass Nearly is a craftsman – when she talks about photography, and when she takes her own picture, we quickly find that her relationship to her art is not one of vague ramblings about the nature of art and photography. Cass is interested in the mechanics of what makes a good photo – how to manipulate film, focus etc. I cannot tell whether her comments will seem insipid to a real photographer, and of course, many of the comments take the form of information dumps in convenient dialogue for readers like me, but it never seems overwhelming or bothersome. It is always tied to Cass’s personal approach to art – Cass’s first and only book featured dead and destitute people of the 1970s/1980s punk scene, and her ideas about photography, as well as the artists she admires, are all centered around this concern with (and sometimes paradoxical seeming distance from) reality. The book starts when Cass is offered a job to interview a legendary photographer who lives on an isolated island off the coast of Maine. She arrives, only to find that the photographer knew nothing of an interview, there are children disappearing in the area, and one morning, the photographer is found dead. Cass’s interest in photographing the dead becomes a central element of the book’s resolution, but more importantly, Hand quite cleverly connects the genre of realist noir to the protagonist’s preoccupation with realism in photography. Many of the character’s musings on her art can be applied to the book’s own genre, with the conventions of realism being questioned quite intently. The conventions regarding what passes for real, and what does not translate not just to the mechanics of plot, but also to the minutiae of style. Hand’s style is self-consciously modern and hard-boiled. She uses pathos that’s quite typical of the genre, in order to shift into certain emotional states that she does not want or need to explore in details not typical of the genre and not expected of this kind of naturalist fiction. Not having read her other novels, I’m obviously speculating, but since this is her first noir contemporary novel, and it is written in a pitch perfect noir contemporary style, she must have created it for this book – and it never reads as parody. Additionally, though Hand is far from the first one to do it, she inserts a female protagonist into a male genre – thus drawing additional attention to questions of gender. 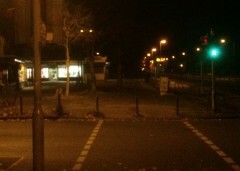 This also gets repeated on the level of photography – or the art world in general. On the island(s) off the coast of Maine, she encounters not just the legendary photographer she was sent to interview – and who is a woman. She also meets male artists, and as if to drive the point home, there is a child that connects these two characters. Art, biology, and the anxiety of influence appear and reappear in various guises throughout. That’s what sets this book apart – it’s not the female centered take on noir, it is not the excellent execution of crime genre writing. It is, instead, the fact that somehow, despite actually running on the rails of genre, it appears to be motivated and pushed and formed by art, and by the protagonist’s obsession with it. 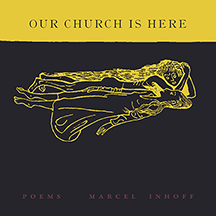 Cass Neary is a close cousin of Thomas Bernhard’s Der Untergeher, an artist brilliant and talented enough to be able to recognize genius and to understand the gulf between her talents and that of the true standout artists of her genre. Cass is obsessed with art, and it is only fitting that the final confrontation is between her and another art obsessive. Everything fits and clicks. That makes it a bit of a disappointment that her next novel, Available Dark, does not rise to the same heights. We appear to meet another art obsessive, we appear to be drawn into another maze of the arduous space between art and life, as Cass Neary is flown to Helsinki to help assess the value of a set of photographs. Instead, in this book, photography and the art and technique of it is incidental. Available Dark sidles up even closer to noir conventions, with Neary sometimes merely following the winds that blow her across the icy Scandinavian plains of a baroque plot. As the resolution presents itself I was more irritated than anything. A lot of stupid people doing stupid things and killing other people for even more generic, stupid reasons. I know that a lot of crime novels are centered around the stupid things that stupid people do (and the half-clever ways they try to cover it up), but that’s not what I find interesting. There’s a disturbing thing that happens at the end of Generation Loss that I am unwilling to spoil, but it is entirely in line with that book’s general theme, but it expands it, and opens up Cass Neary’s world into another direction – it’s tough to see it fall by the wayside within the first couple of pages of Available Dark, serving merely as motivation for Cass to take that Helsinki job. However, whatever misgivings I may have about Available Dark, they don’t tarnish Generation Loss, which is fantastic. Read it if you like that sort of thing. It’s good.